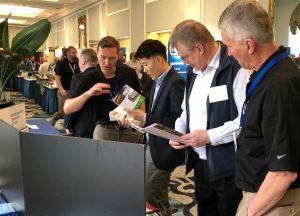 Our very busy 2019 trade show and conference schedule is off to a fast and productive start in Charleston, South Carolina (U.S.), as we’re live at the Belmond Charleston Center Hotel exhibiting at the Society of Plastics Engineers (SPE) Thermoset Topical Conference (TOPCON). 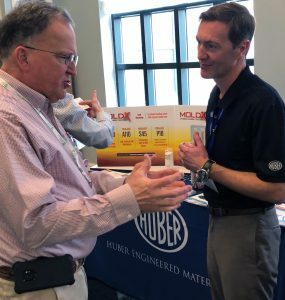 A key annual stop, we have the opportunity to visit with technical experts from throughout the thermoset industry to discuss our halogen-free fire retardant additives and ground calcium carbonate extenders. Hubercarb® W4 ground calcium carbonate is also a high performance mineral in thermoset applications offering a rounded particle shape with chalk-like softness. Two key advantages of the grade are it contains very low levels of crystalline silica along with low leachable chloride content. It is milled from a unique micritic limestone ore and is one of the purest forms of GCC available. For more information about the Hubercarb W4 grade, click here. We’re excited and pleased about the success we’ve achieved this week at TOPCON and can’t wait to see you soon in all parts of the world as we exhibit and have the opportunity to personally meet you and discuss our product offerings which are backed by superior technical service with unsurpassed customer care second-to-none. For samples of any of our products, contact us today!